Over 9,000 hectares of vineyards, citrus blocks and vegetable farms cover the Wentworth region, producing tonnes of fresh produce each year. Local residents and governments work hard to ensure that the production of this produce is protected and in some cases, ready for overseas export. One of the biggest threats to this fruit is fruit fly. 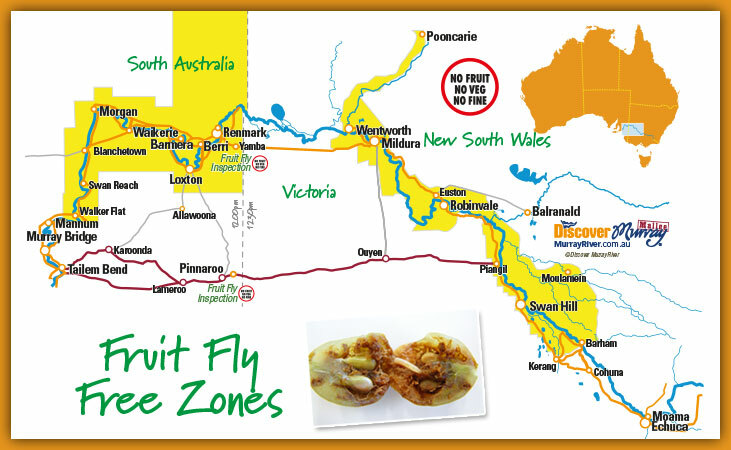 Currently, Wentworth falls within the Greater Sunraysia Pest Free Area, which lies within the overall Fruit Fly Exclusion Zone. To ensure that the area remains pest free, there is a ban on bringing fresh fruit and vegetables into the area. Fines do apply! For more information on fruit fly information – visit here.